These DVD Videos play on TV DVD players and computers , but the disc content can also be transferred to other devices like tablets and smartphones. Click "DEMO VIDEOS" above to view demos. Southwest Birds DVD- $29.99: two disc set with four hours of video and sounds for 290 species found in the deserts and mountains of the Southwestern U.S. (Arizona, New Mexico, West/Central/South Texas, southwest Oklahoma and southern California/Nevada/Utah). Western Birds DVD-$29.99: two disc set with over three hours of video and sounds for over 300 bird species found in western North America (west of Mississippi River, including Canada and Alaska). State/Province Version DVDs- $19.99: two hours of video and sounds for about 150 species. Ideal for beginners because it makes it easier to identify birds by focusing on species that are commonly found in each region. Titles are now available for ALL STATES AND PROVINCES. Coastal Version DVDs-$19.99: two hours of video and sounds for about 150 species. Ideal for beginners because it makes it easier to identify birds by focusing on species that are commonly found in each region. GULF COAST (covers coastal regions of AL, FL, MS, TX). SOUTHEAST COAST (covers coastal regions of FL, GA, NC, SC, VA). A revolution in birdwatching! After watching these DVD videos, we guarantee you will know more about birds that you are likely to encounter where you live and travel. - Beginning and advanced birdwatchers will enjoy viewing unique and entertaining behaviors. - In addition to preferred habitats for each species, the video clips display diagnostic field marks and sounds for species identification. - Sophisticated menus on the DVD and a printed timeline with the VHS allow you to quickly locate species of interest. The DVD videos play on TV DVD players, computers and other portable devices. Printed instructions and a bird checklist are included in the DVD cases. A sampling of DVD covers are displayed below. 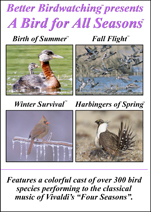 A Bird for All Seasons- DVD Video- $15.99. A great gift item for bird lovers of all ages! Features a colorful cast of over 300 bird species performing to the classical music of Vivaldi's Four Seasons. Turn on subtitles to reveal bird names. Bird list included. Summer-Fall Combo- DVD Video- $11.99. Winter-Spring Combo- DVD Video- $11.99. Spend the long days of summer with the birds as they bathe to keep cool, raise their young and participate in the neverending search for food. Features a colorful cast of 160 bird species. Shorter fall days inspire an urge to migrate. Watch as birds get ready for takeoff, gather in flocks and engage in feeding frenzies. Features a colorful cast of 131 bird species. Battling Snow and Wind. Struggling to Find Food. Predators Searching for Prey. Features a colorful cast of 85 bird species. An inspired vision of birds heralding the arrival of spring. Courtship Displays. Territorial Battles. A Chorus of Song. Features a colorful cast of 170 bird species.